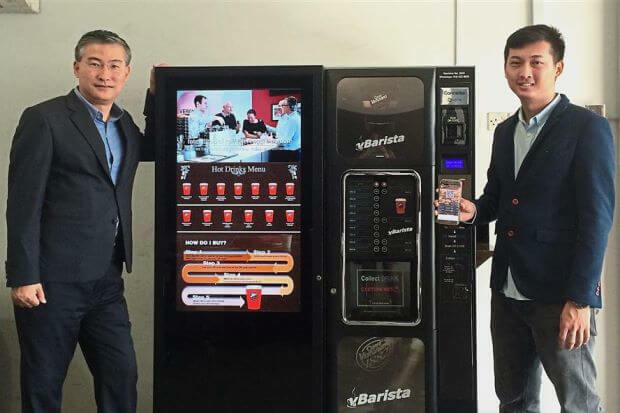 Malaysia is soon set to see a new brand of coffee vending machines, vBarista. Owned by VendPays Sdn Bhd, the vending machines are manufactured in Italy. Each machine contains ground coffee beans supplied by Italian coffee supplier Caffe Vergnano. A fresh steaming cup of coffee will cost customers RM3-RM6. How’s this different from the other coffee vending machines? Well, the vBarista coffee machine accepts cashless payments via QR Codes. To be able to make cashless payments, the user will have to set up an account on vBarista website. Here, making a prepaid payment will generate a QR Code on the user’s smartphone. At the vBarista vending machine, the user can get the QR Code scanned to complete the transaction and get their cup of coffee. “It (QR Code payment) is convenient and this form of payment is widely used in advanced markets like China. It is a little slow here. People still think about putting money into vending machines.But once this picks up, the potential for this business will be bigger.” – Eldrick Koh, Co-Founder and Chief Marketing Officer, VendPays Sdn Bhd. The vBarista vending machines will be open for business from July 13, 2017. By the end of 2017, Robert Woo expects to set up 100 vBarista machines across Kuala Lumpur and Petaling Jaya. A part of their long term plan is to set up close to 1,000 machines within the Klang Valley area. What are your views on the vBarista coffee vending machine? Share your thoughts in the comments section below.